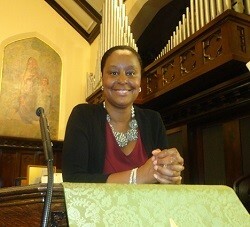 The Reverend Rhonda R. Taylor joined United Methodist Church of Hartford on July 1, 2014. Previously she served First & Wesley United Methodist Church of West Haven, where she had been since 2007. She describes her core ministerial gifts as " administration, pastoral care, Biblical teaching, preaching and creative worship." She was awarded a Bachelor of Business Administration degree from North Carolina Central University in 1990, and a Masters of Divinity degree from New York Theological Seminary in 2003. She entered the ministry in 2004, and was ordained as an elder in 2007. Prior to the ministry, she worked in the fields of banking and computer technology. Pastor Taylor was born and raised in Queens, New York, where her father still lives in the same house in which she grew up. Her mother, who recently made her transition to be with the Lord, left her with " a legacy of Southern etiquette and teaching." She describes herself as "an energetic and optimistic servant of God." She states "I will strive for spiritual excellence and am committed to loving God and God's people." Pastor Taylor characterizes her interests as "music, cooking, dancing, running, travel, exercise, meeting new people, and relaxing (hey, a girl can only dream)."